Last week we reported that the DVD and Blu-Ray release for District 9 had been thankfully moved up to December 22nd, just in time for Christmas. Well, now we have more DVD news. 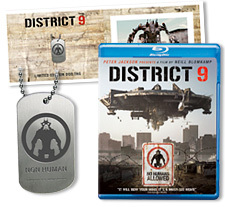 Best Buy is doing a deal where you can get an exclusive lithograph and “Non Human” emblazoned dog tags with pre-order any version of District 9. Check out the promotional picture of the freebies below. For free, it looks pretty cool, though there does seem to be a catch. You have to order a $5 “gift pack” to receive it. I’m not sure if the gift pack is the freebie itself or something else.